Knee Lever Brackets for Pro-Series Sho-Bud pedal steel guitars. Cross shaft apron support for Sho-Bud Pro-Series pedal steel guitars. 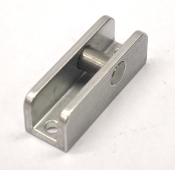 Helper Spring Bracket to fit various early models of Sho-Bud pedal steel guitars. 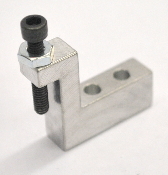 Knee Stop Bracket to fit various models of Sho-Bud pedal steel guitars. Pedal stop bracket to fit Sho-Bud early model pedal steel guitars. Stop Bracket to fit various models of Sho-Bud pedal steel guitars. 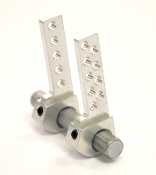 Support brackets for hex cross shaft bushings on Sho-Bud pedal steel guitars. Aluminum channel supports for mounting knee lever bracket on Sho-Bud pedal steel guitars. This bracket is used with the Pro Series hex shaft knee lever brackets #125-100 . Aluminum angle supports for Ø.3125" (5/16") round and hex cross shafts on Sho-Bud pedal steel guitars. Round and Hex cross shaft bushings to fit Sho-Bud pedal steel guitars. 5, 9, & 12 hole bellcranks for late model Sho-Bud pedal steel guitars with 5/16" hex cross shafts.